Modern business is not confined to the physical boundaries of the office. The prevalence of mobile and handheld devices means you can take your work anywhere, from the local cafe to an international flight. With the sophisticated computers you already carry everywhere you go, literally, any place can serve as your temporary office. And with business becoming ever more mobile and flexible, the logical next step is mobile business intelligence. 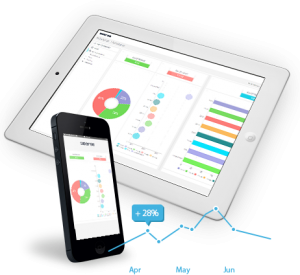 Mobile BI lets you access your business intelligence dashboards anywhere and at any time, using any mobile device. Going on a long business trip? Keep a close eye on how the office is holding up by regularly checking on the status of important KPIs using your smartphone. Have some time to kill on the train? Whip out your tablet and start crunching the numbers on last week’s sales reports. 1. A complete white label mobile app that you can download from the Apple or Android app store. Using the mobile app, you can explore your dashboards with native mobile gestures optimized to let you dive deep into your data or apply filters to view the data you want. These dashboards are built with a ‘mobile first’ design to boost user engagement and keep the brand experience consistent by placing analytics within a mobile app. 2. An entirely browser-based Business Intelligence experience, with no local footprint and no installation required. All you need is an internet connection and any type of mobile device, including all types of laptops, tablets, and smartphones. These dashboards are responsive to your device, and work straight from your device’s built-in web browser: no messy downloads, app store sign-ins or installation required. Simply browse to your dashboard and jump straight into the insights. 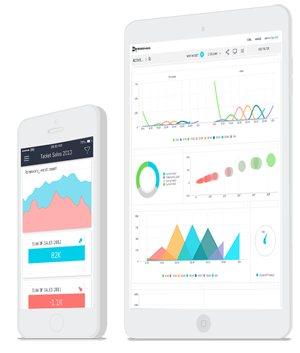 Sisense Mobile BI App was designed according to the latest standards of “mobile first”. This means that everything was designed to work on any screen and on any device — unlike many applications that provide a buggy mobile interface as a last-minute afterthought. For browser-based BI, every element in the dashboard is responsive and will still appear crystal clear and beautiful, even on the smaller screen of your iPhone or Samsung device. Both versions allow you to easily check your dashboard, filter, interact with them and reach actionable insights wherever you may be, and get up-to-date information in seconds.